For the denizens of the “Mud Whale,” it is year 93 of the Sand Exile. The Mud Whale is an island city of clay and magic floating atop an endless sea of sand. On that island, an isolated community of exiled criminals clings to life. Chakuro is the archivist for the Mud Whale, and he diligently chronicles the lives and deaths of his people, who are cut off from their own dark history. As Children of the Whales, Vol. 8 (Chapters 29 to 33) opens, the Mud Whale sails closer to the promised haven of Amonlogia. The island's dark history, however, still poses a threat to its people, one example being the story of the “daímonas,” known as Midén. Is Ouni, the leader of the “moles,” destined to be the next cursed daímonas? Meanwhile, Commander Orca plots a return to the Mud Whale to settle old scores. THE LOWDOWN: The Children of the Whales manga was one of the best manga and graphic novel series of 2018 and was one of the best debuts of 2017. Now, it is one of the best manga and graphic novel series of 2019. 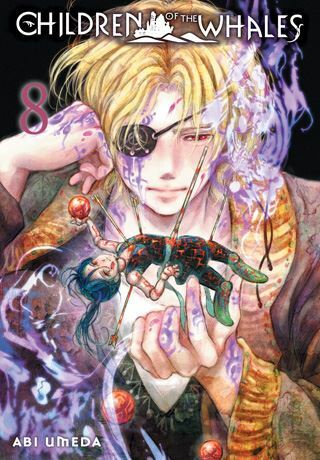 Children of the Whales Graphic Novel Volume 8 delves deeper into the history of the Mud Whale, even as the islanders prepare to leave it for a new home. It is as if creator Abi Umeda is tying both the characters and the narrative even tighter to the Mud Whale. That creates a sense of mystery. What is really going to happen next? Read this must-read graphic novel and find out. I READS YOU RECOMMENDS: Readers looking for unique graphic novels for young adult readers and teens will want the VIZ Signature title, Children of the Whales.